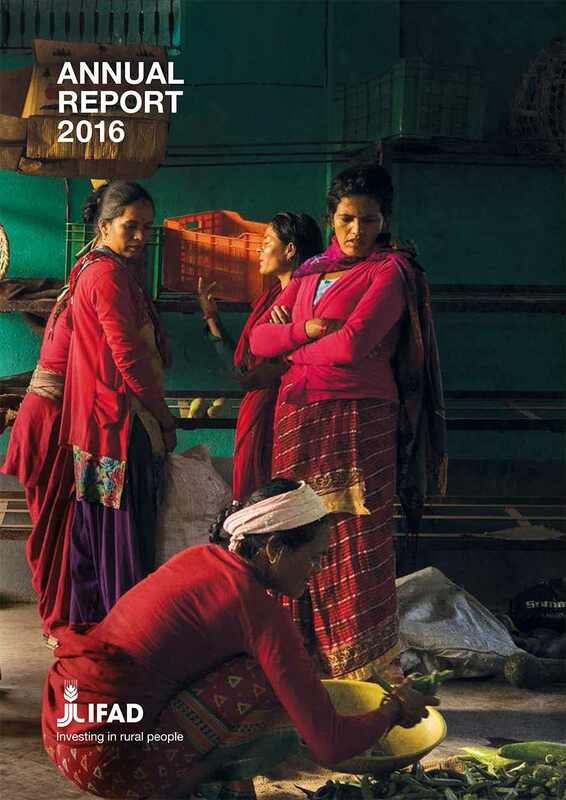 IFAD’s Annual Report and Highlights for 2016 have just been published. People from across the organization have contributed and the report contains a wealth of information on the year’s work and results – stories, facts, figures and analysis. Here’s a snapshot of the ongoing portfolio and new approvals during the year. 211 ongoing programmes and projects funded by IFAD in partnership with 97 governments. IFAD’s investment in the ongoing portfolio was worth US$6.0 billion. Domestic contributions and external cofinancing for the ongoing portfolio amounted to US$7.3 billion. The total ongoing Programme of Work amounted to US$13.4 billion. 53 new grants were approved in 2016 worth US$56.9 million. The AR map in the front cover of the main report shows ongoing projects by region and by country. It also shows ICOs – both operational (40) and planned (4) − and proposed subregional hubs (8). At the time of publication of AR2016 (June 2017), total IFAD loan and grants approved since 1978 were worth US$18.5 billion and the programmes and projects we support had reached about 464 million people. The Annual Report is more than just numbers. Read the stories from the field and hear from some of the rural women and men that IFAD invests in. In Nigeria, young farmer Peter Okonkwo has doubled his yields as a result of the Value Chain Development Programme. In Madagascar, IFAD has enabled rural residents to gain legal rights to their land. A TV soap opera in Laos – My Happy Family – has spread the word about good nutrition for children and adults. In a remote and arid region of Brazil, a cooperative run by women is making money processing wild and native fruits. In the West Bank, a young couple who cultivate strawberries have used a loan to increase greenhouse planting space, enabling them to sell early for the highest prices. This week, as part of a Partner Spotlight running 17-21 July, GFAR Secretariat will share these stories from different regions around the world where IFAD investments have made an impact on the lives of small farmers and poor producers. The Foreword to the Annual Report Highlights for 2016 by IFAD President, Gilbert F. Houngbo, can be accessed here. This news is adapted from a blog post by Hazel Bedford, IFAD Annual Report Coordinator, and is part of our Partner Spotlight this week on IFAD.